The Mayor is first citizen of the Borough and is elected by the Councillors every year at the Annual Meeting of the Council. The Mayor chairs meetings of the Council during his/her term of office, and presides at civic and other ceremonial events held in the Borough. Councillor Crouch is the elected member for Wigton. Councillor Crouch will hold the post for 2018/19 and his consort for his Mayoral year will be his wife, Heather Robbins. He is a trained demonstration chef who travels the world to cook for different audiences, having recently held a Cumbrian cooking demo at the World Trade Centre in Mumbai. He also spends a lot of time working in the local community, holding fundraising dinners for a number of different causes and visiting schools where he carries out themed demonstrations for school children. Sid8 Foundation who are a grassroots organisation based in Maryport raising money to fund health checks on sporting people. 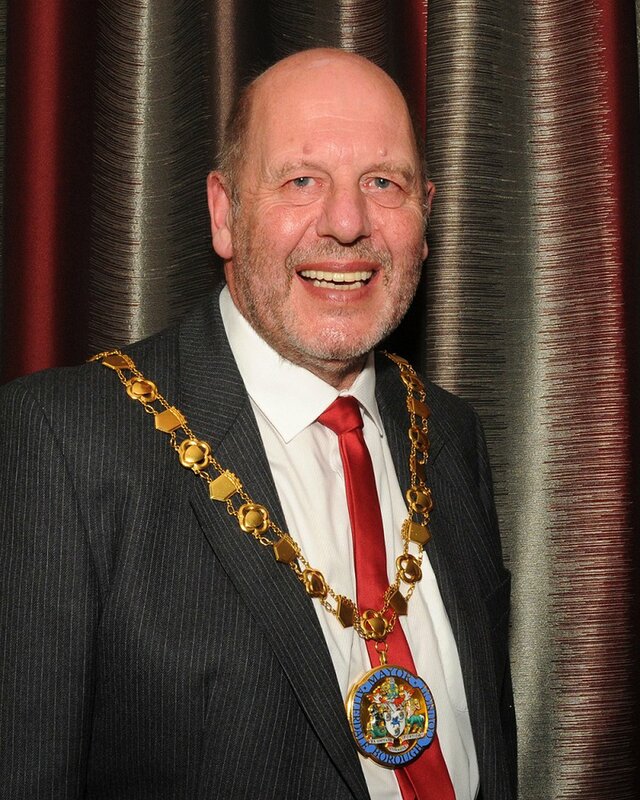 Councillor Neil Schofield, ward member for St Michael's in Workington, is the Deputy Mayor. His wife, Kate, is the Deputy Mayoress. 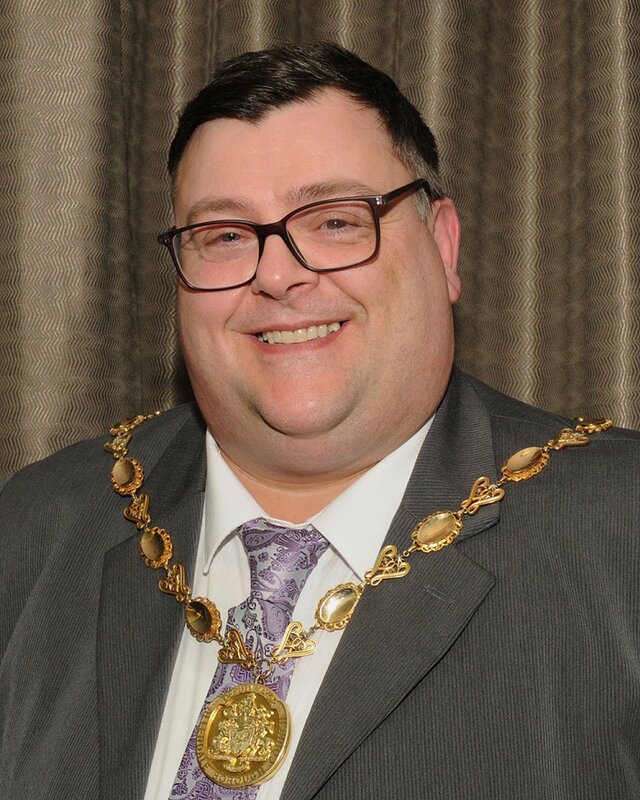 Born in Greater Manchester Cllr Schofield has been in catering for over 30 years and having held many positions within the industry, he currently works for Caterlink as Catering Manager at Workington Academy. He married Kate in August 2011 at St Marys church Westfield and they have one son, Samuel. As an Allerdale Borough Councillor for St. Michaels ward he has also served on the Audit Committee as both Chair and Vice Chair and for a short time he served on the Corporate Scrutiny Committee as Vice Chair. For a number of years he has served on many committees on Workington Town Council which include: Finance, Property and Employment Committee (Chair and Vice Chair), Culture Committee (Vice Chair), Policy & Resources Committee, Planning Committee, Allotment Committee. What does the Coat of Arms represent? Individuals and families obliquely referred to, include:- Fletcher Christian, John Peel, the family of Senhouse, the family of Egremont, the family of Lowther and the family of Curwen. This is the centre piece of the coat of arms. It represents the theme ‘productivity with inspiration’. The winged horse of classical mythology is for inspiration (Pegasus, the inspirer of poets, of engineers, of inventors etc. ); out of the horns of plenty- or cornucopias- grow wheat, corn, bluebells, daffodils, orchids etc. This symbolises ease and swiftness of communications. Legend has it that Pegasus opened the poetical water courses with a blow of his hoof, so his presence on the coat of arms represents the stunningly beautiful rivers and lakes within Allerdale. This Pegasus is one with a slight difference as he has a unicorn. The unicorn is a symbol of purity and of healing. He therefore represents the borough council’s mission to care and to preserve as well as being an allusion to its commitment to family health. In the 18th century folk were fond of saying ‘My Pegusus isn’t working today’, if they meant that their poetical inspiration had dried up. As it happens, the unicorn’s horn is used by the families of Christian and Curwen. The green mural crown is the symbol of civic authority. The elephant is used in heraldry for integrity, unity and magnanimity. Its trunk supports a miner’s pick and the weathervane on top of its howdah is cast in the form of a ship to allude to the maritime industry, the ship building of Silloth and of Maryport and of Workington, and the continued busyness of maritime trade. The howdah is a standard fixture, but it is intended that the oval lunettes should recall thrushes’ eggs and therefore Wigton where the Council meetings were originally held. 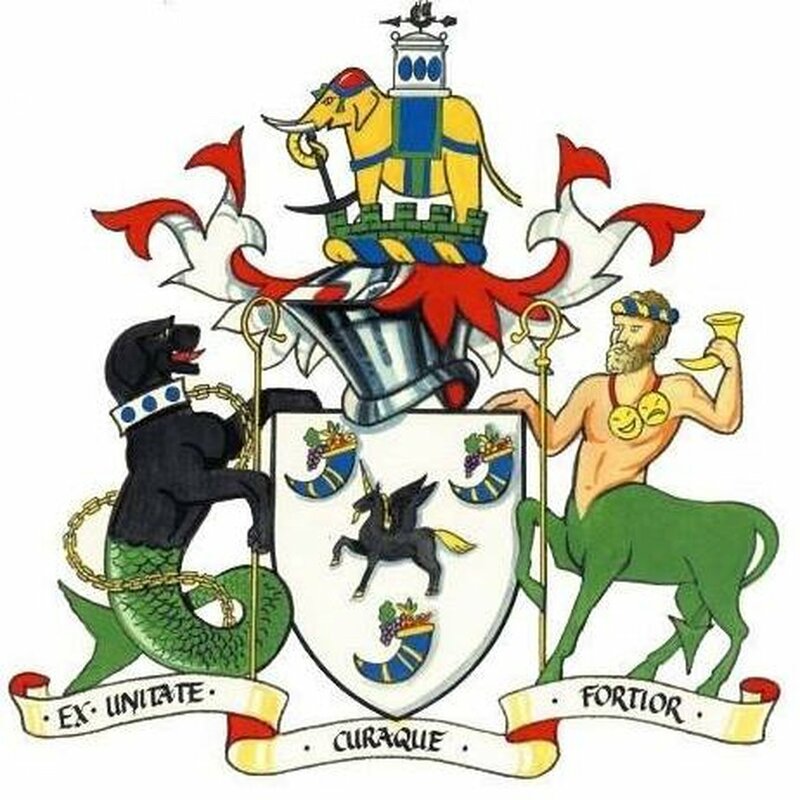 Together the tinctures of the elephant, whether white, gold, green, red or blue are meant in their various configurations to allude to the arms of Egremont, Senhouse etc. The weathervane is also a reference to harnessing the wind’s power as is done between Workington and Flimby. The supporter on the right is a centaur who not only recalls the Roman past of the area but, more importantly, he stands for education, benevolence, hospitality and wisdom. Education because of the centaurine knowledge of medicine and music and instruction in all subjects. The centaur was dignified and noble amongst the Ancients; they were also hill dwellers, which is appropriate. The centaur has around his neck a cord on which hang the two marks of drama, the mask of tragedy and the mask of comedy; he holds in his left hand a bugle horn to allude to the musical life of the area; his forelegs support a Crozier which is a reference to the ecclesiastical and monastic Allerdale. St Patrick is represented as using one of these croziers as is well known. The centaur has the short stumpy tail of a dragon as an allusion to the Lowther family. The other supporter on the left is the plain or coast dweller, the sea dog or marine dog. As such he is an obvious reference to the activities of the towns of the coast and also to an inland sport, namely salmon fishing. By his name he alludes to Fletcher Christian whose arms’ colours are also represented on the collar. The ship building and the mercantile maritime life which the sea dog refers to is concentrated by the appearance of a ship’s chain round his body attached to the collar; of the same colour is the staff which he supports, its upper end finished in a crook or to balance the Crozier opposite; this is for both sheep-rearing and rambling.